The nature of nursing will mean that we are likely to be are exposed to a range of challenges. It’s not unusual for nurses to witness aggression, feel unsafe, have first-hand exposure to other people’s tragedies, and to deal with the physical and emotional outcomes of trauma. This emotionally taxing environment can be pretty stressful. It’s something we should talk about. I’m often asked to talk about this sort of stuff at inservice education sessions. This page is a 2019 update to support those sessions. Printed handouts are so last century. I’m recycling and combining a lot of old ideas for the 2019 sessions. Self-plagiarism? Nah – it’s a groovy remix of some favourite old songs. Regular visitors to meta4RN.com may recognise the repetition, and be quite bored with me using the website as a place to store updated versions of old stuff. Sorry about that. I’ll pop-up a new and original post in coming days. Here are the resources and references used in the presentation: (because I’m recycling old ideas this list is ridiculously self-referential). That was bloody stressful! What’s next? Thanks for visiting. As always your comments are welcome. 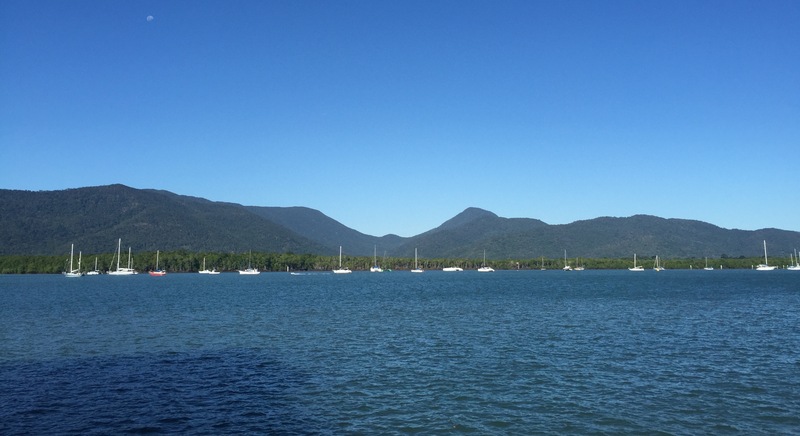 This entry was posted in Blog and tagged clinical supervision, education, emotional intelligence, emotional labour, mental health, nurse, nurses, nursing, secondary trauma, stress reactions, workshop on 22 February 2019 by Paul McNamara. Look. I’m a terribly busy and important person. I barely have time to write this blog post, let alone satisfy my lazily-never-pursued fantasy of writing a novel. 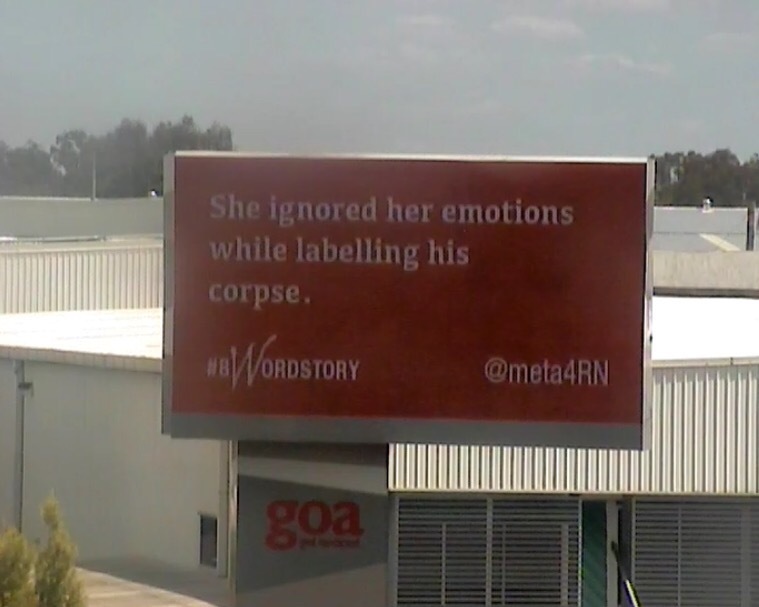 Luckily, the Queensland Writers Centre offered a solution: the eight word story. Eight words is the perfect length for somebody with the attention span of a stoned goldfish (eg: me). Yesterday, one of my eight word stories was published by the Queensland Writers Centre. 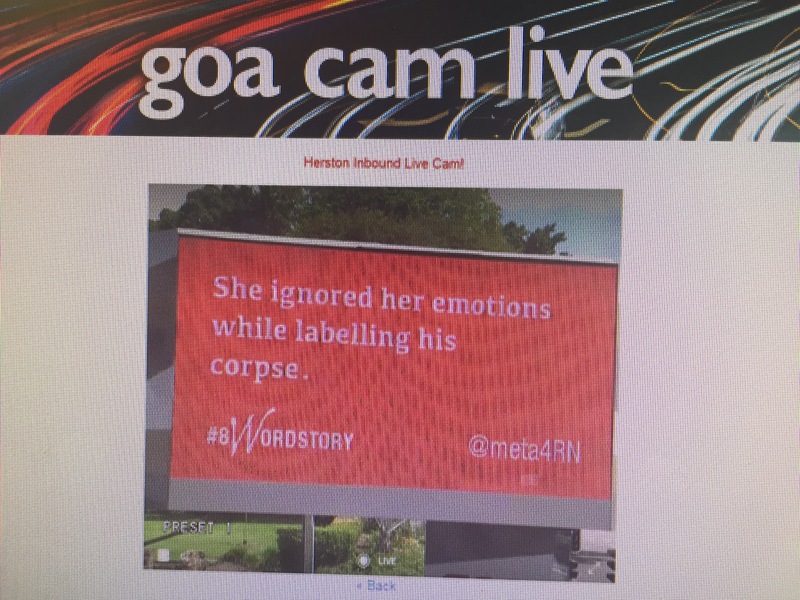 Published on electronic billboards, that is. 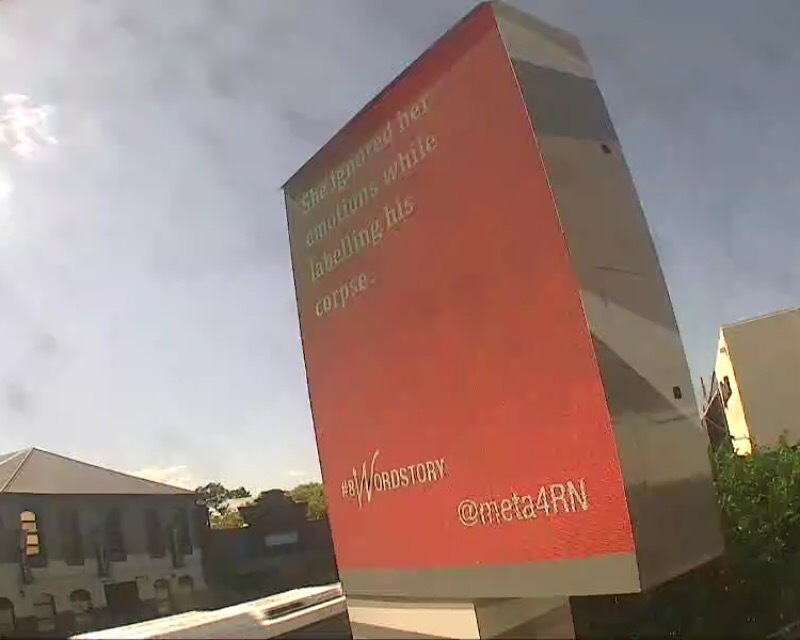 Billboards that grace the busy roads, roundabouts and motorways in and around Brisneyland. The story published was one of three stories I submitted on Twitter for the #8WordStory project. Intentionally, all three of the stories relate to my work experiences. When writing these stories I was ambitious to be ambiguous. When there are only eight words to write, the reader needs to be able to bring their imagination to the story. 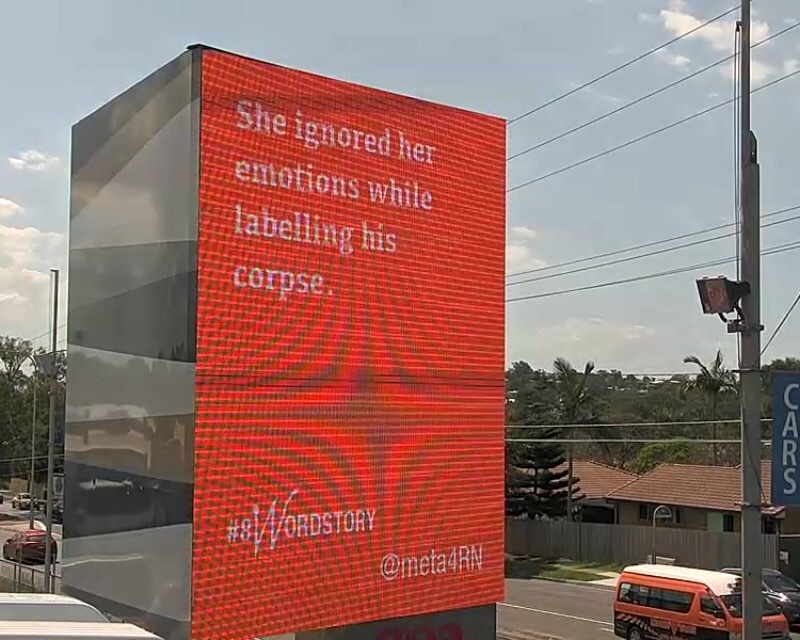 Interestingly, the story that was the most ambiguous of the three is the one that made it to the billboards. I wrote this remembering my experiences of being with patients during the last hours of their life and for the first hours of their death. Nursing’s unique role of caring for a person’s body both in life and death is rarely spoken about or acknowledged. It’s one of those peculiar privileges of nursing. The story is ambiguous enough for people to project their own meaning (eg: Lea’s tongue-in-cheek Tweet). I’m cool with that. I was thinking of a young medical ward RN who had just intervened when a patient tried to harm himself. We had a quick “corridor consult”. She asked a couple of unanswerable questions, shed a couple of tears, wiped her eyes, washed her hands, then assumed her usual energetic and positive demeanour. One minute there’s a crisis. Next minute it’s business as usual. Hold and contain three things: the crisis, the patient, your emotions (not necessarily in that order). About 1 in every 60 Australian midwives is a male. I thought it would be more interesting and ambiguous to cite that minority in this story. Crying is usually considered in a negative light in mainstream society, but midwives know crying as a sign of life. My 15 minutes 8 words of fame. The story provides the frame. The imagination does the work. Why don’t you give an #8WordStory a go too? Submit yours via Twitter or web page. Big shout-out to the Queensland Writers Centre for this great initiative. Thanks for reading this far. As always, feedback is welcome via the comments section below. 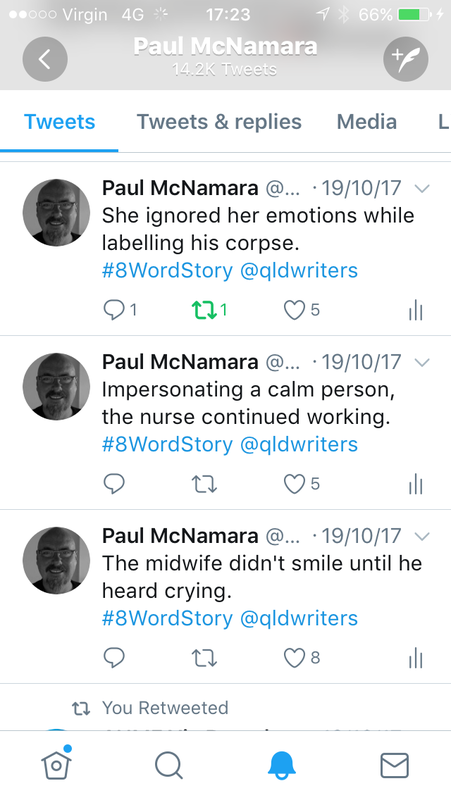 This entry was posted in Blog and tagged 8WordStory, creative writing, emotional labour, nurse, nurses, nursing, Twitter on 3 November 2017 by Paul McNamara. Phatic Chat: embiggening small talk. Small talk is a big deal. Small talk is the oil that keeps the machinery of interpersonal relationships running smoothly. Small talk even has its own name. It’s called “phatic chat”. Phatic chat has been described as “A type of speech in which ties of union are created by a mere exchange of words” by Bronislaw Malinowski (no relation to Barry Manilow). This is why I think it’s important that us health professionals be intentional about phatic chat. Every, “Hello. My name is…” and “How are you today?” serves to create a working relationship between people. Health professionals rely on working, therapeutic relationships. Phatic chat/the nonspecific factors of psychotherapy show the person that there is someone who is interested in them and their concerns. It helps people feel understood, accepted and respected. 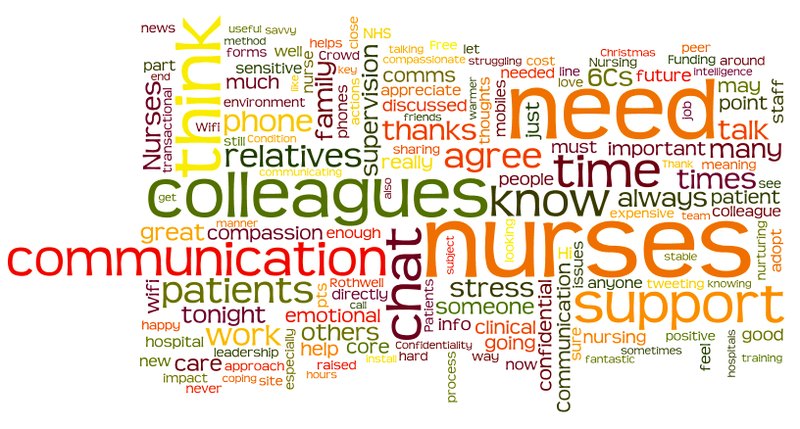 In my current gig – providing mental health support in the general hospital – I often get told by patients how good it is to be nursed by someone who is good at phatic chat. It’s easy to imagine, isn’t it? Who would you rather attend to your vital signs, IV antbiotics, wound dressings, and pain relief in hospital: a friendly person who chats and listens, or someone unfriendly and officious who just goes about the tasks at hand? There’s more than one way to prime an IV line. It sounds simple, and (to my ear anyway) pretty patronising. However, it’s clear that many clinicians do not routinely engage in phatic chat. That simple idea has been one of Kate’s greatest legacies (she died in 2016). If you’re not familiar with the #hellomynameis story, I urge you to visit the hellomynameis.org.uk website for more info. Shaking hands is a respectful thing to do. I always offer a handshake when introducing myself to patients (they’re often surprised!). Make a cup of tea for the patient. Even if they say “no thanks”, let them know that you’re making one for yourself anyway, so are happy to make them one while you’re at it. Take instructions on how the person likes it . Apologise if you make it too hot/strong/weak or spill it. Sip yours when they’re talking: if for no other reason, it let’s them know you’re not about to interrupt. Despite the paper’s title, the same demonstrations of humbleness, politeness and respect work for whitefellas too. I nearly always use when Google Maps when introducing myself to people who have come to the hospital from out of town. “Oh you’re from Aurukun? I’ve been to Wujal Wujal, Laura and Hope Vale, but I’ve never been there. Do you mind if we use this map on my phone to see where you live?” It’s nearly always a great way to break the ice, especially when meeting with someone from a different culture. It sets the right tone of showing that you’re interested and approachable. I’m lucky to work in a place where I meet with Aboriginal and Torres Strait Islander people all the time. By getting the Aboriginal/Torres Strait Islander person to show me around their community on a map, I’m acknowledging/demonstrating that they know stuff that I don’t know, and I’m prepared to learn from them. Sometimes I’m a bit more skilled at using the Google map app on my phone, so I get to show the person how I can be helpful, in a kind and respectful way. It probably doesn’t hurt that we’re both looking at the map together and working on the same task (it demonstrates that we can work together, and you don’t want to rush into making a heap of eye contact with someone you’ve just met). While we’re using the app to find their house, the local school, favourite fishing or camping spot, and other landmarks we’re getting to know each other a bit. I’m not left in that clumsy position of being accidentally too pushy, too intrusive, too task-orientated. Spending a few minutes establishing rapport is what phatic chat is all about. The phone/map app is just a prop, but it’s a great prop. A while back I had a gig educating uni students. One of the best tricks-of-the-trade when in a uni lecturer role is to introduce people to words they have not heard before. This makes you look cleverer than you really are, and lends an illusion of credibility. The phrase/notion of “phatic chat” as a defence against the forces that seek to turn nurses into unempathetic box-ticking robots came to my attention via Professor Eimear Muir-Cochrane’s keynote presentation at the ACMHN 39th International Mental Health Nursing Conference, held in Perth, Western Australia, 22nd-24th October 2013. As always your thoughts/feedback is welcome in the comments section below. This entry was posted in Blog and tagged cromulent, embiggen, emotional intelligence, emotional labour, hellomynameis, mental health, nurse, nurses, nursing, nurturing, phatic chat, phatic communication, small talk, Twitter on 12 October 2017 by Paul McNamara. Nurses and other health professionals are expected to attend to hand hygiene about eleventy seven times a day. The WHO and HHA recommend 5 moments for hand hygiene: before touching a patient, before clean/aseptic procedures, after body fluid exposure/risk, after touching a patient, and after touching patient surroundings. 57.4% of Australia’s nurses/midwives are hospital/ward-based [source], they’re doing A LOT of hand hygiene. On top of that, while they’re going about their business and busyness, ward-based nurses are interrupted 10 times an hour [source]. Yep, every 6 minutes there’s something or somebody distracting us from our tasks and thoughts. Dangerously disorderly much? Hopefully that doesn’t happen to neurosurgeons, commercial airline pilots, tattoo artists or Batman. Pro-Tip: most of us can not do this at work. Only respond to distractions with face-slapping if you are Batman. So, here’s the idea: if you’re going to do hand hygiene dozens of times a day anyway, don’t just do it for your patients: do it for yourself too. We’re not cold callous reptilian clinicians, we’re educated warm-blooded mammals who do emotional labour. We need to nurture ourselves if we are to safely continue to nurture others. 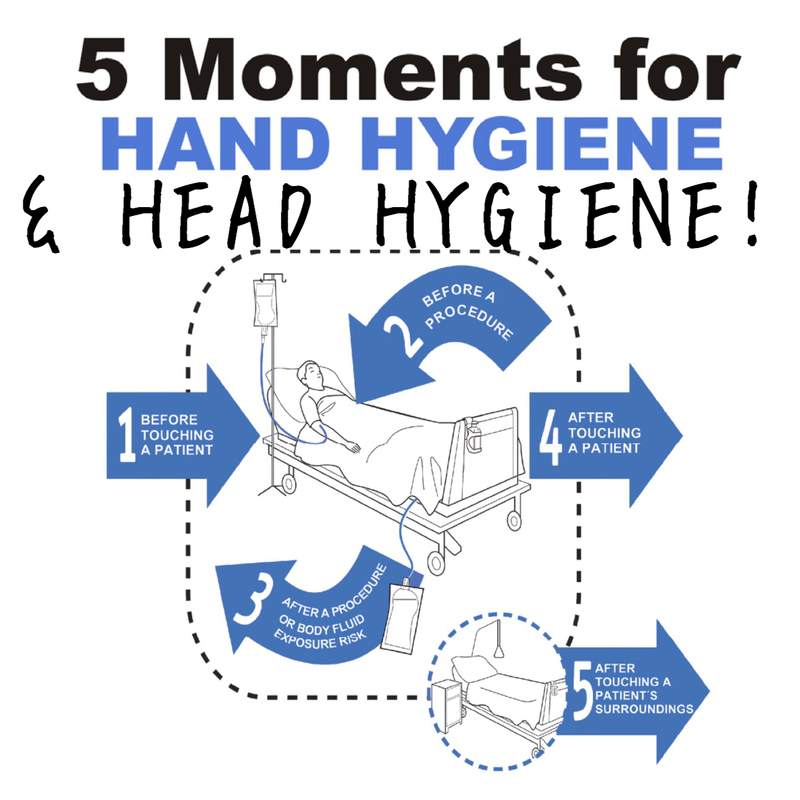 5 moments for hand hygiene & head hygiene! Turn the 5 moments of hand hygiene into mindful moments. Make the 5 moments for hand hygiene 5 moments for head hygiene too. Yes, clean hands save lives – let’s not forget that clear heads save lives too! Step towards the pump bottle with intent. This is my mindful moment. I’m taking a brief break. The rub is slippery at first. Frictionless fingers feel fine. Feel the product texture and temperature. The rub is cooler than the air. The rub is cooler than my fingers. It feels nice. Start with cleaning. The first half of my hand hygiene routine is about rubbing stuff off. Let the stuff I want to get rid of float away. Move on to restoration, healing. The second half of my hand hygiene routine is about rubbing in resilience and health. Let the stuff that sustains me seep into my skin. Check in on the breathing. The slower and deeper the better. If the breathing or the brain are running too fast, slow down and repeat steps 5 and 6. There’s no rush. Slowly scan the surroundings. With any luck someone from infection control is watching. Breathing slowly, its time let the air rinse off the residue. One more slow breath. Its time to get back to work. Step towards the sink with intent. This is my mindful minute. I’m taking a brief break. Feel the water flowing over both hands. The water’s warmer than the air. The water’s warmer than my fingers. It feels nice. Add soap. It’s slippery. Frictionless fingers feel fine. Start with cleaning. The first half of your hand hygiene routine is about washing stuff away. Let the stuff you need to get rid of flow down the drain. Let it flow away. Breathing slowly, its time rinse both hands. Breathing slowly, its time to thoroughly dry both hands together. Throw the towel in the bin. Clean hands save lives. Clear heads save lives too! This is not my original idea. I first stumbled across the idea of combining hand hygiene with head hygiene via Ian Miller‘s November 2013 blog post “mindfulness during handwashing”: http://thenursepath.com/2013/11/18/mindfulnurse-day-8/. I’ve been using the idea myself and suggesting it to colleagues and students ever since. When I left the clinical environment for a few months, I found myself really missing intentionally punctuating my day with mindful moments. Since returning to clinical practice I’ve come to appreciate the strategy even more than I did when I first started using it 3 years ago. So why am I blogging about it too? Why now? 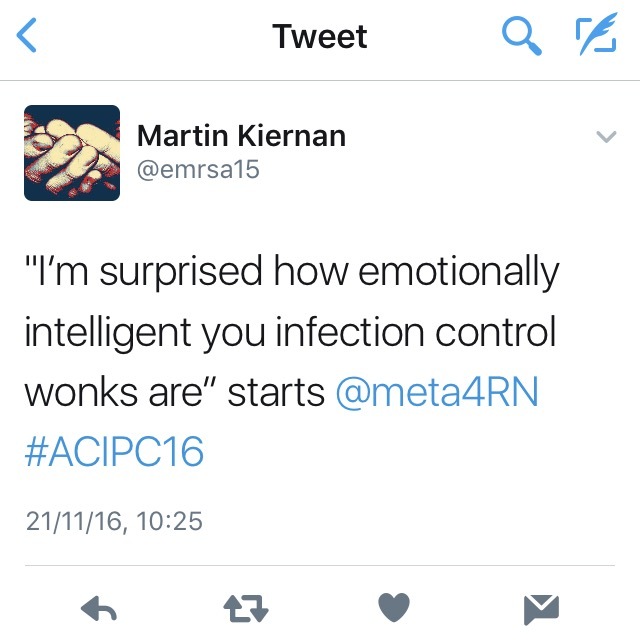 Well, on Monday I attended the Australasian College for Infection Prevention and Control 2016 conference to chat about Twitter [link to that presentation here. Also, check-out the #ACIPC16 hashtag here and here]. Luckily I was there for the opening plenary sessions, and was pleasantly surprised at the emotional/psychological literacy that was being displayed and advocated for. The opening presentations by Peter Collignon, Mary Dixon Woods and Didier Pittet all went to some lengths to emphasise the importance of emotional intelligence, constructive communication and building relationships. It was really impressive stuff; giving the hand hygiene and mindful moments idea a remix is my way to give recognition/thanks to the #ACIPC16 conference delegates and organisers. There are others too. Do you think using hand hygiene as a mindful moment could become mainstream? That’s it. As always your comments are welcome via the space below. 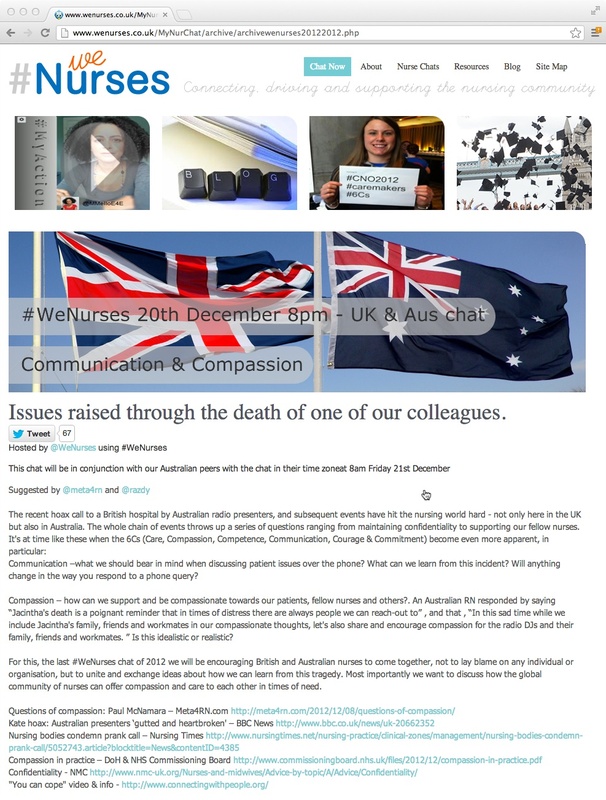 This entry was posted in Blog and tagged anxiety, cleanhandsclearheads, communication, conference tweeting, depression, emotional intelligence, emotional labour, handhygiene, mindfulness, nurse, nurses, nursing, nurturing, secondary trauma, stress reactions on 26 November 2016 by Paul McNamara. I’m a nurse. Every day at work somebody is in crisis. People have life threatening injuries and illnesses. People experience suicidal ideation and sometimes act on those thoughts. People experience delirium, dementia and psychosis – they lose touch with reality. People behave in unexpected and challenging ways. All of these people are in crisis. They are having the worst day(s) of their life. When you are part of the clinical team trying to help out these people it’s always useful to acknowledge and clarify the nature of the person’s crisis. It’s surprising what the individual’s perception of the crisis is. I’ve met a person who was desperately unwell – ICU unwell – who’s subjective crisis was that the cat was home alone without anyone to feed it. That was the crisis she wanted me to respond to. I’ve met quite a few people who need urgent medical/surgical interventions, but who perceive their biggest crisis as being unable to smoke a cigarette right now. I’ve had the peculiar privilege of spending time with people who have survived suicide attempts, who have experienced a crisis related to abuse, financial problems, relationship breakdown, and loss of job/role/independence/sense-of-self. An existential crisis in mind, body and spirit. All of these people are in crisis. It is their crisis. It is important to ascribe ownership. The nurse/midwife/physician/other clinician is not experiencing the crisis; they are responding to the crisis. We (the clinicians) have not been immunised against crises, but we do have the responsibility to do whatever we can to not get overwhelmed by them. Also, truth of the matter is, I’m not sure how long you would last if you responded to every day at work as an adrenaline-filled, too-busy-to-wee, emotional rollercoaster. That be the road to burnout and breakdown, my friend. We use Jedi Mind Tricks, pithy sayings and clinical supervision. That’s what we do. I’ve written about clinical supervision before (here and here). Despite the name, it’s not about scrutiny. Clinical supervision is about reflecting on clinical practice with a trusted colleague, and asking simple questions of yourself: what did I do? ; what were the outcomes? ; how did I feel? ; what lessons did I learn?. The idea of clinical supervision is to acquire and refine clinical skills. If you recognise your own anxiety you’re more capable of managing it. Intentional slow breathing is an excellent intervention for this. 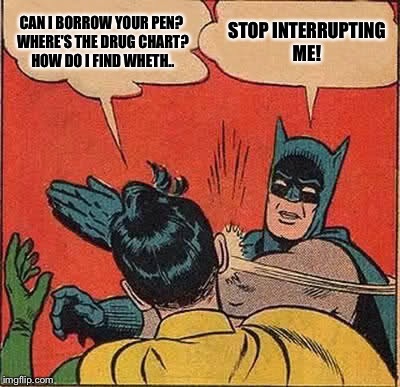 You can do it while you’re scanning the patient/file/environment. It is not a crisis. A crisis is when there’s a fire, storm-surge, tsunami, earthquake or explosion that requires evacuation of staff and patients. If the hospital is not being evacuated it’s not a crisis. It’s just another day at work. 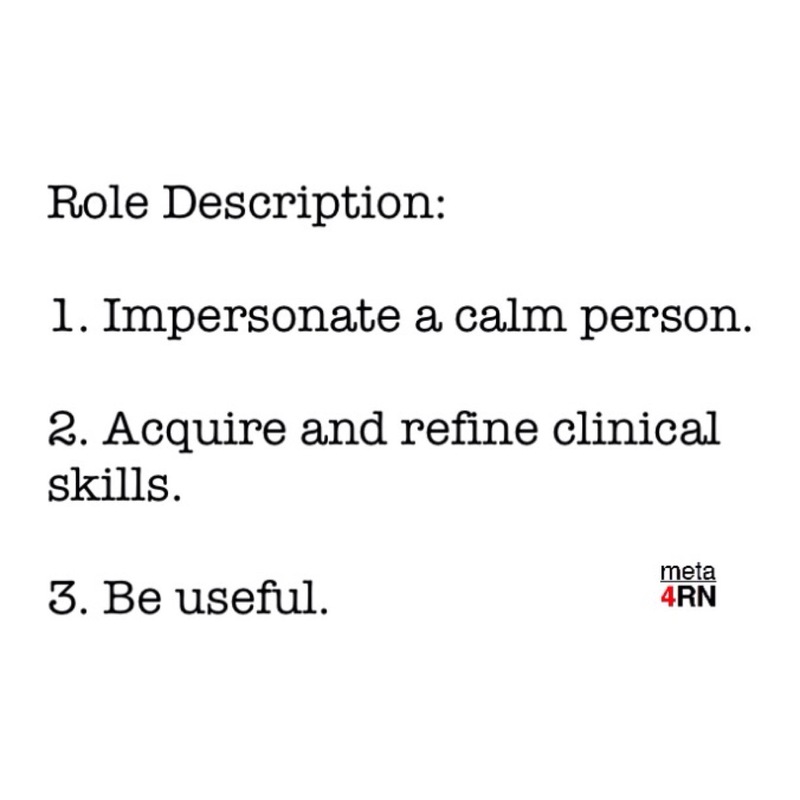 When impersonating a calm person I conjure-up a person who was a CNC when I was a student nurse at the Royal Adelaide Hospital. Part of the apprenticeship model of nursing education at the time was to give students experience in RN roles. I had been thrown into the Team Leader role on a day when the neuro ward was especially busy. There were emergency admissions, a stack of post-op patients – two of whom were really unwell, a person dying in the side room, and an inexperienced unqualified overwhelmed drongo (me) coordinating the whole thing. We were in trouble. We needed more nurses and a proper team leader. “First things first. No need to shower/clean anyone unless they’re incontinent.” There goes about 50% of the morning’s workload in an instant. “Don’t bother with routine 4-hourly obs unless the person looks unwell. Only the post-op patients and the clinically unwell patients need their obs done.” There goes another 10% of the work. “Let’s get Fiona (the most experienced and skilled nurse on the shift) to look after the two dodgy post-op patients and nobody else.” The biggest concern was instantly taken care of. “Bring all the nurses in here (a cramped nurses station overlooking 2 bays of 6 patients each) and tell them the plan. Make sure they all drink water and coordinate their breaks.” Got it. To look after the patients you need to look after the nurses. “After you’ve told the nurses the plan, tell the patients/visitors who aren’t critically unwell the plan. They’ll understand we’re abnormally busy if we tell them.” Open, honest communication? Who’d have thought? “Slow down your breathing. Use your humour. You’ll be fine. Come and grab me if you need.” My racing thoughts slowed. Panic evaporated. We, nurses and patients alike, had a good shift. All the vital stuff was done. It wasn’t a crisis. It was a day at work. I haven’t seen that CNC (her name is Lee Madden) since 1992, but I think of her every now and then. Whenever I see a crisis unfolding or see/feel anxiety rising, I wonder, “What would a calm person do?” and conjure an image of Lee floating serenely into the space. I channel Lee’s reassuring smile and clear understanding of priorities, and do my best to behave in the way she modelled to an impressionable overwhelmed student nurse. Crisis? What crisis? 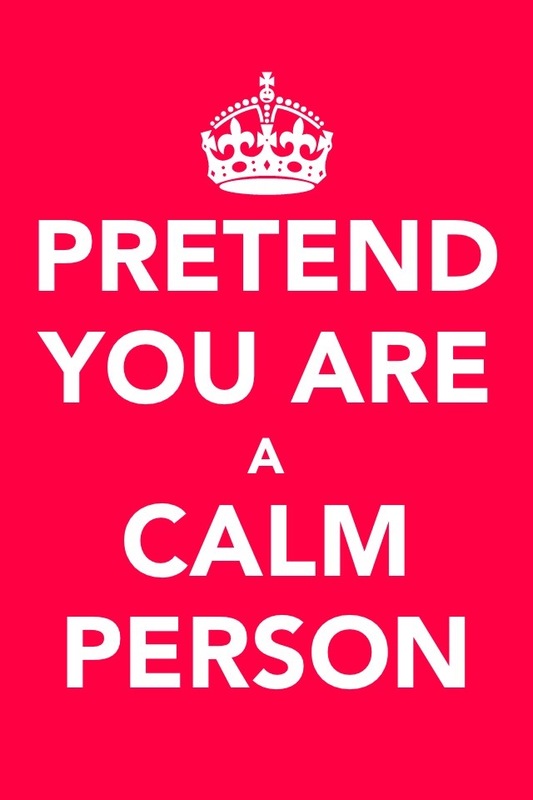 I’m impersonating a calm person. As always, you’re welcome to leave comments below. 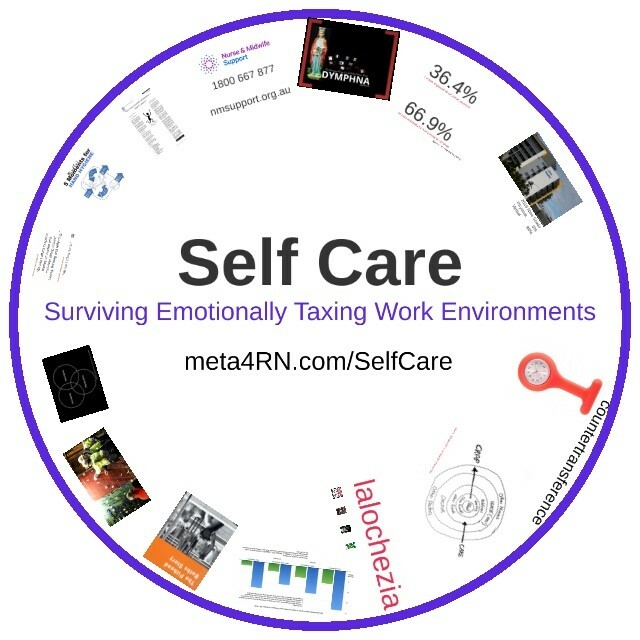 This entry was posted in Blog and tagged clinical supervision, emotional intelligence, emotional labour, nurse, nurses, nursing, secondary trauma, stress reactions on 5 September 2015 by Paul McNamara. The first time I read “Field Notes on Death” by Lea McInerney was two years ago when I stumbled across it via the #DyingToKnowDay hashtag. It is a beautiful, poignant piece of writing, where Lea draws on her experience growing-up Catholic in the 1960s/70s, and later becoming a nurse. I’ve re-read Field Notes on Death four or five times over the last couple of years. I re-read it again this morning. Just as I did every other time, I quietly started crying about three quarters of the way through. I cry too easily. I have been terribly embarrassed by this on many occasions. It’s not that I don’t think men shouldn’t cry, it’s just that I think I cry too easily. Too easily for my liking anyway. A couple of things happened recently which make feel slightly less embarrassed. One was seeing the generous, open display of grief shown by Adelaide Football Club players and staff after the death of the team’s coach. For those not familiar with Australian Rules Football, the players are mostly “blokey blokes”. They are men so manly they make other men question their manliness. They’re fit and fearless. Tonka trucks are nowhere near as tough. These manly young men wept openly in public. Not embarrassed. Not ashamed. They have never been more inspiring. Never been better role models. Where I grew up we have a saying that translates into English as “lives close to the water”. It refers to people who are sensitive. People who cry easily. I have always lived close to the water. It’s a lovely metaphor. Doesn’t everyone want to live close to the water? That’s where you’ll see some of the most beautiful views. Field Notes on Death is a great read. I intend to re-read it and re-share it every year on #DyingToKnowDay. I thoroughly recommend it to anyone, and think nurses and other health professionals who are exposed to end of life care/issues will find it especially useful. Thanks for reading. As always your comments are welcome below. This entry was posted in Blog and tagged emotional intelligence, emotional labour on 8 August 2015 by Paul McNamara.